Seriously WHY?! 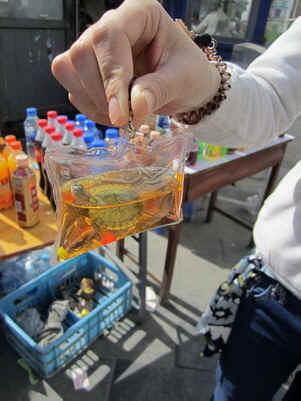 Chinese vendors are selling live fish and turtles in a sealed baggy as key chains. 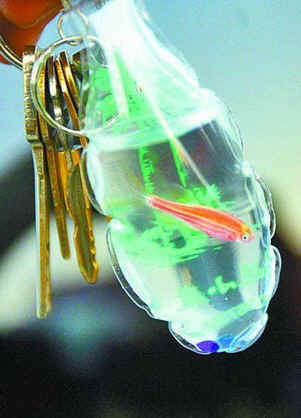 According to a news report on Chinese media, the hottest new fad in China involves selling a live fish, or a Brazilian turtle or a young giant salamander sealed up in airtight plastic bags as key rings. 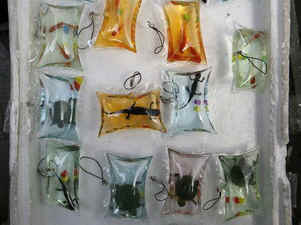 Each packet is about 7 centimeters in length and filled with colored water along with the imprisoned animal. The street vendors claim the water is nutrient rich, but they are not. Without oxygen and food the animals get to live for only a few days, if they are lucky. The most depressing part is that the whole thing is legal. However, no need to worry as rumor has it that nothing goes to waste – the cadavers are heated in the microwave for 15 seconds and eaten while enjoying an ice cold beer. 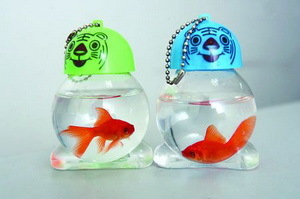 These "adorable" little gifts, which are typically sold at subway and train stations, are protected by law and, according to said law, are not considered animal abuse.